New Castle City Council swears in Crystal Mariscal who is the first Latina to serve on town council. 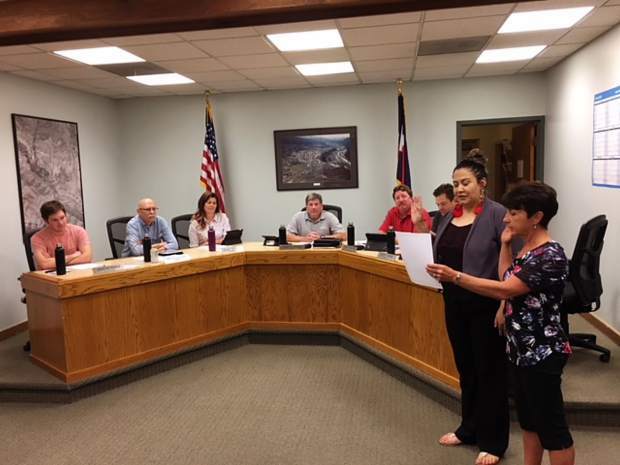 The New Castle Town Council has appointed Crystal Mariscal as its newest town representative, as well as the town’s first Latina to serve on the board. Last month, New Castle Mayor Art Riddile thanked council member Mary Metzger for her 10 years serving on town council before she stepped down. The town then began the process of finding a resident to serve in her vacated seat. Last Tuesday, the board chose Mariscal to fill her seat until the next election. Mariscal has been in New Castle since 2012. After growing up in Mexico she came to Colorado when she was 16 years old without speaking English or a high school education. She said she went back to school for her GED and learned English along the way. “When you’re hungry and have kids to feed, you have to learn from wherever you can,” she said. In her application for the seat, Mariscal said she considers New Castle her home and wants it to be the place her four kids grow up. She said she wants to be an example for others in the Latino community because if she’s not afraid to do it, others won’t be either. She said she’s received a lot of texts from people in Spanish telling her how thankful they are and how inspired they are by her.